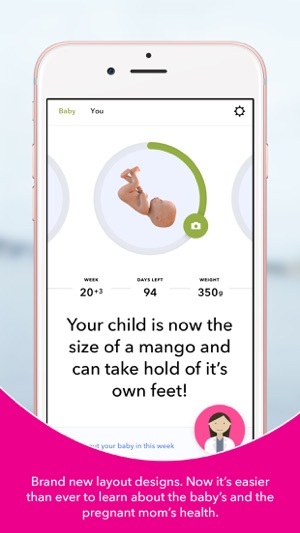 A complete Pregnancy app developed in collaboration with the University behind the Nobel Prize in Medicine and the Swedish Midwife association. Welcome to your virtual pregnancy doctor! 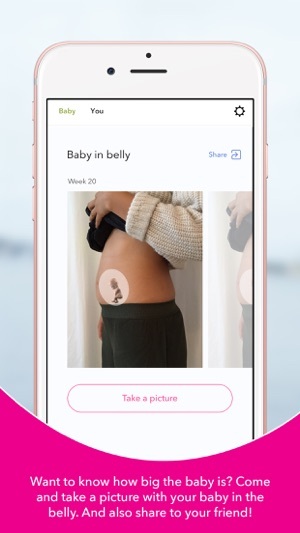 With symptom checker, pregnancy calendar, smart suggestions and a unique belly camera My Pregnancy by Bonzun is a complete Pregnancy App where you can follow the development of your baby and check your own health. 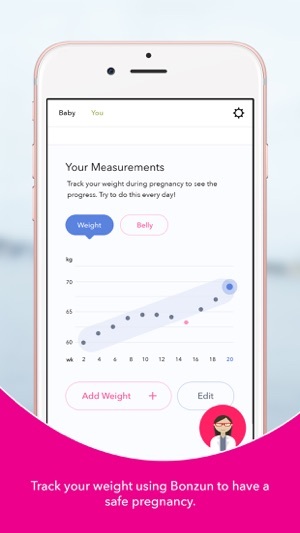 My Pregnancy is developed together with Karolinska Institute so you can rest assure that everything in the app is evidence based and updated with the latest guidelines. 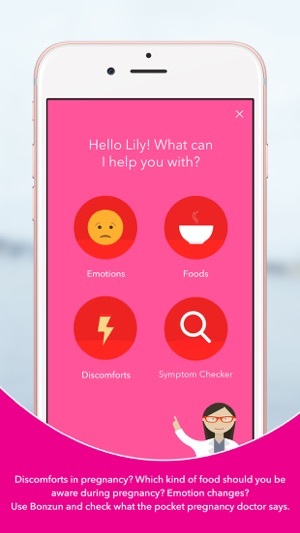 • Symptom checker – A truly unique feature that can save lives and give you answers without calling your doctor. Just click and learn if your symptom is a sign of something serious or if you safely can stay home. • Pregnancy Calendar – Learn how your baby is developing and how the pregnant body’s changing, what’s normal and what discomforts may appear and how to treat them. • Track and monitor your Tests – our award winning feature! Get the same insights as the doctors by learning what your blood tests really mean. • Weight tracker - track your weight daily and learn how your body is changing. • Sharing with the Family – this app can be personalized for dads, partners and grandparents too! Recommended by health care providers. Created with the help of world leading experts in the fields of maternal care and child birth to provide you with the most up-to-date evidence-based information. This app is not intended for medical use, or to replace the advise of a trained medical doctor. 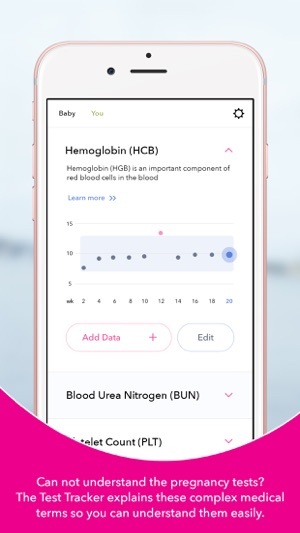 Bonzun Health information AB disclaims any liability for the use or misuse you make of the app, which is provided to you on a general information basis only and not as a substitute of a personalized medical advice. If you have any concerns about your pregnancy consult with your doctor or midwife immediately. My Pregnancy is an award winning app, downloaded and used in over 79 countries world wide. My Pregnancy by Bonzun was awarded Best Pregnancy app by Baby London, Top Health app in UK by the Sun Magazine, Top 3 pregnancy health apps in China. Bonzun is also included in Stockholm Hotlist - by Swedish Government, as top Swedish companies within Life Science. The app is used in Midwife Education in Africa and was awarded "Innovation against Poverty by Sida for spreading free maternal care to developing countries. Thank you for using My Pregnancy by Bonzun. Contact us at info@bonzun.com for any questions or suggestions. • UI improvements and usability fixes. My wife has been using this application since the day we found out. It's full of information and I look forward to reading about my baby's development each week. It's the best application out there during pregnancy, I've tried a few this is by far the BEST! Good heathly is always my interess. So when I found this app I used it to manage my family health. I sent it to my sister because she is a pregnant. 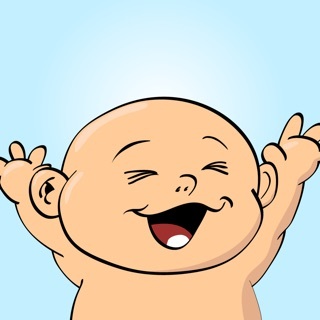 She said that love to have advice that for each week which food she need to eat for a good baby health. Anyway thank for useful app.